Simons Town is the naval centre of South Africa. 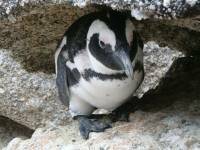 Named after Simon van der Stel, it is situated just beyond Boulder's Beach along the seafront of False Bay. Although small, Simon's Town is picturesque, full of character and has good restaurants to enjoy the freshest seafood while enjoying spectacular views. For those interested in the navy, the South African Naval Museum is worth a visit in addition to the Martello Tower in Martello Street. The Tower itself was built in 1776 and is probably the oldest British built structure in the country. There is another naval museum called the Simons Town Museum that traces the history of the navy to what it is today. Of special interest in Simon's Town is the statue dedicated to a dog. A great dane in fact, named Just Nuisance. Just Nuisance lived during World War II. He was quite a character for a dog, reputedly hanging around with the sailors enjoying a drink or two and accompanying them on the train into central Cape Town. There are many tributes to this special dog in Simon's Town and all are worth a look.